To make the pipian sauce you need some good pumpkin seeds like the Bob’s Red Mill. The sesame seed is another very important ingredient in the pipian and here you can buy it organic. Your dish is very Mexican, therefore you have to serve it on a very Mexican plate. 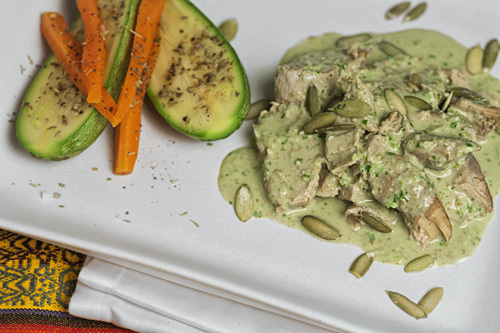 Now we have a tasty recipe from the state of Oaxaca, the pork in pipian. The pipian is a salsa in which the pork is cooked and gives as result this dish. The name pipian is a derivation from the word “pepita" (pumpkin seed), indispensable ingredient of the pipian. As you can imagine this is going to be an uncommon recipe since pumpkin seeds are used in its preparation although this is only one of the many exotic ingredients that are used in its preparation . In fact the pipian is more interesting that what you think because it has a rough consistency and when it is mixed with the pork’s flavor a unique flavor is generated. This main course can be served plain or it can be accompanied with white rice , Mexican rice , refried beans or corn tortillas. When someone is going to cook something that has pipian as name, it is normally thought that is something very difficult to make. The reality is that the pipian is not that difficult to make, just some tricks have to be learned that will be given along the way. The pumpkin seeds and the sesame seeds that are used to make the pipian should not have any flavoring. We give the recipe with pork loin but another pork cut could also be used. The pipian is prepared with Mexican pepper leaf because it gives a formidable flavor. Try to get it if not omit it. Preparation time 1 hour 10 minutes . 28.2 oz of Pork Loin. 1 Garlic clove (.1 oz). When it boils reduce to medium heat, cover the saucepan and leave the pork loin cooking in the boiling water for approximately 1 hour, until it is well cooked. Make sure that the pork is always covered with water because it will consume. If scum accumulates on the surface remove it. If the pork loin is cooked in a pressure cooker, it will be ready in about 30 minutes. 1/2 cup of Pumpkin Seeds. 1/4 cup of Sesame Seeds. Roast the frying pan ingredients for about 2 minutes, until they are lightly roasted; stir regularly. The pumpkin seeds and the sesame seeds are roasted to potentiate the pipian’s flavor. Transfer from the frying pan to a blender the seeds that were roasted, then reserve. Transfer from the saucepan to the blender, with a kitchen spoon, the ingredients that were cooked. 1/4 of an Onion (1.2 oz). 1 cup of Water (8.4 fl oz). Blend very well the ingredients, then set aside. Heat in the saucepan over medium heat 1 tablespoon of olive oil. The Pipian Salsa that was prepared. Bring the saucepan salsa to a boil over high heat. When the salsa boils reduce to medium heat and cook it for about 5 minutes, until it thickens a little; stir occasionally. Then set aside. Verify that the pork loin that was left cooking is well cooked and soft; if not cook it for a longer time. Take from the saucepan the pork loin, with the kitchen spoon and cut it into slices of approximately .2’’ thick. Put in the saucepan (where the pipian salsa is) the pork slices that were cut. Put the saucepan over medium heat and cook the pork in green pipian for about 2 minutes, until the salsa is very thick; stir regularly. Tip: If you have some pumpkin seeds and sesame seeds available, they can be put as garnish over the pork in pipian – it will look beautiful. Variation: Pork in red pipian. Did you like the Pork in Pipian? ✒ History of the Mexican Cuisine. ✒ Articles about the Mexican Food.